Brisbane Piano Centre offers full service to all makes and models of pianos. 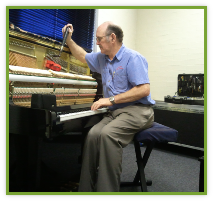 Kerry Cooper is an Australasian Registered Piano Technician (ARPT). Kerry is tuning an upright piano in a coaching studio for Opera Queensland. The requirements to have the piano at concert pitch A440 is very important as well as having the tuning remain stable. Click the button to contact us!